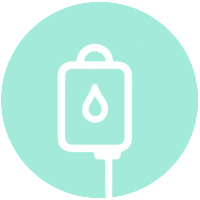 Our Intravenous Nutrition (IV Nutrition) program was developed to provide our patients with injectable liquid vitamins that help supercharge the immune system and replenish vitamins and minerals that may be deficient. IV Nutrition delivers high quality nutrients that are easily absorbed into the body. Because the nutrients are delivered directly into the blood stream and do not have to pass through the digestive tract, they are absorbed much more efficiently. With a comprehensive lab panel, we are able to customize the ingredients in your IV “Cocktail” so you are receiving exactly what your body needs.